May 24, 2011, Washington, D.C. – The Center for Constitutional Rights (CCR) today launched a Freedom of Information Act lawsuit seeking immediate release of documents that the United States government has refused to provide regarding its knowledge of and role in the deadly May 31, 2010 attack by Israeli commandos on a Gaza-bound aid flotilla. Among the nine civilians killed was 18-year-old U.S. citizen Furkan Doğan who was shot several times as he was filming the 4:00 a.m. raid, and then shot in the face at point blank range as he lay there wounded. Fifteen other U.S. citizens participated in the flotilla, including five who traveled on a U.S. registered boat; many were beaten and injured. The attack by Israeli commandos took place in international waters in the Mediterranean Sea against a six-boat humanitarian flotilla headed to Gaza with more than 700 civilian passengers. One of the ships was registered in the U.S. The flotilla sought to bring food and other humanitarian supplies to the people of Gaza, who have been living under an Israeli blockade for nearly five years. 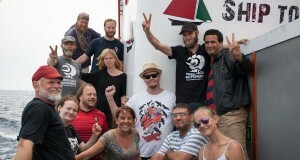 To read the complaint, visit the Center for Constitutional Right’s legal case page or http://ccrjustice.org/ourcases/current-cases/gaza-freedom-flotilla.